Requirements - Cleaning work up to 1000 V must be carried out under supervision of a qualified electrician according to EN 50110-1 "Operation of electrical installations - Minimum Requirements". 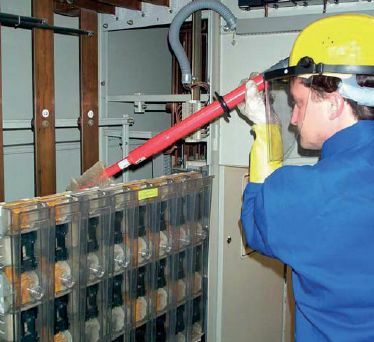 In Germany TRS NS dry cleaning kits are subject to BGV A3 of the national accident prevention regulations (UVV) "Elektrische Anlagen und Betriebsmittel" [Electrical installations and equipment] stipulated by the German Employer's Liability Association for the energy, textile, electrical and media product sector (BGETEM). Requirements - Cleaning work from 1 to 36 kV must be carried out under supervision of a qualified electrician according to EN 50110-1 "Operation of electrical installations - Minimum Requirements", observing clauses 6.3.1 to 6.3.12. In Germany TRS MS dry cleaning kits are subject to BGV A3 and BGR A3 of the national accident prevention regulations (UVV) "Elektrische Anlagen und Betriebsmittel" [Electrical installations and equipment] stipulated by the German Employer's Liability Association for the energy, textile, electrical and media product sector (BGETEM). Application - Damp sponges allow to remove tough pollution layers and to clean oily transformer surfaces. Special insulating cleaning liquids (e.g. Rivolta SLX 500; SLX TOP or SLX Super from Bremer & Leguil, Duisburg/Germany, and Florin 2000 from Flore, Koblenz/Germany) must be selected according to the rated voltage of the installation and the environmental conditions. 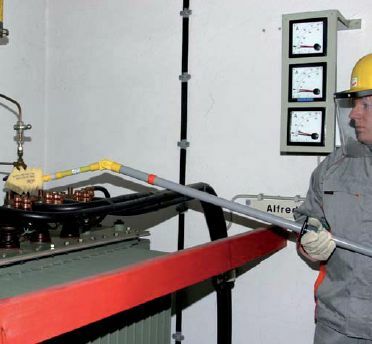 Requirements - Cleaning work from 1 to 36 kV must be carried out under supervision of a qualified electrician according to EN 50110-1 "Operation of electrical installations - Minimum Requirements", observing clauses 6.3.1 to 6.3.12. 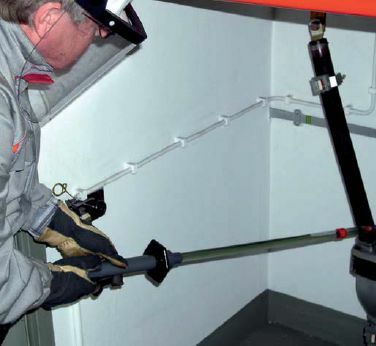 In Germany FRS ZK MS damp cleaning kits are subject to BGV A3 and BGR A3 of the national accident prevention regulations (UVV) "Elektrische Anlagen und Betriebsmittel" [Electrical installations and equipment] stipulated by the German Employer's Liability Association for the energy, textile, electrical and media product sector (BGETEM). 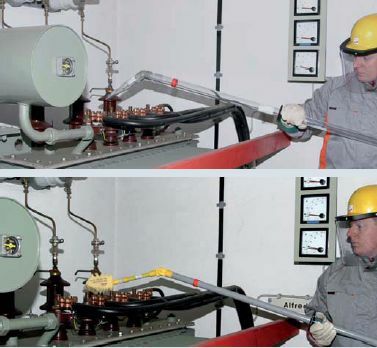 Application - Dry cleaning work is performed by suction cleaning with operating heads or brushing soiled parts of the installation while simultaneously sucking the dirt away. Loose dust layers and cobwebs are easily removed with little effort. Damp cleaning eliminates oily and tough contaminants with the help of sponges soaked with special insulating cleaning liquids. 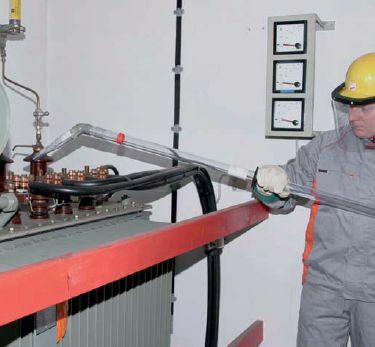 Requirements - Cleaning work from 1 to 36 kV must be carried out under supervision of a qualified electrician according to EN 50110-1 "Operation of electrical installations - Minimum Requirements", observing clauses 6.3.1 to 6.3.12. 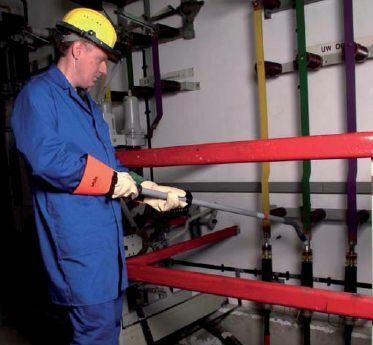 In Germany TFRS MS combined cleaning kit are subject to BGV A3 and BGR A3 of the national accident prevention regulations (UVV) "Elektrische Anlagen und Betriebsmittel" [Electri - cal installations and equipment] stipulated by the German Employer's Liability Association for the energy, textile, electrical and media product sector (BGETEM). Design - The refilling device consists of a pumping unit with a reservoir, regulated heating and pump as well as an insulating refilling lance. The oil reservoir can be removed for easy transport and can be sealed with a cover. 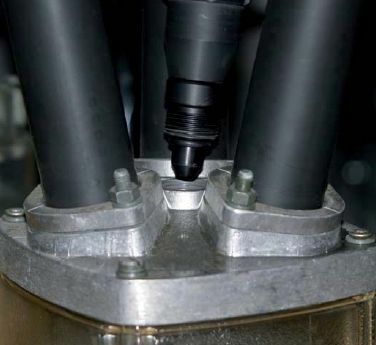 The pump and the insulating refilling lance are connected by means of a temperature- resistant, removable and highly flexible refilling hose and a pump control cable (Ein [On]/Aus [Off] circuit). All components are arranged on a transport vehicle (with additional support brackets), suitable for mounting. When working under live conditions, the screw plugs of cable sealing ends are removed and replaced with an insulated screw driver. Special plastic screw plugs can be used for sealing the cable ends. Requirements - The refilling device is to be used under supervision of a qualified electrician according to EN 50110-1 "Operation of electrical installations - Minimum Requirements", observing clauses 6.3.1 to 6.3.12. In Germany NFG MS refilling devices are subject to BGV A3 and BGR A3 of the national accident prevention regulations (UVV) "Elektrische Anlagen und Betriebsmittel" [Electrical installations and equipment] stipulated by the German Employer's Liability Association for the energy, textile, electrical and media product sectors (BGETEM). Application - The insulated screw driver with interchangeable operating heads (straight and angled) for attaching special bits and screw plugs allows to loosen or tighten the screw plugs of cable sealing ends under live conditions. Only tested bits (screw plug blade inserts) and special screw plugs may be used. Requirements - Maintenance work from 1 to 36 kV must be carried out under supervision of a qualified electrician according to EN 50110-1 "Operation of electrical installations - Minimum Requirements", observing clauses 6.3.1 to 6.3.12. In Germany MS screw drivers are subject to BGV A3 and BGR A3 of the national accident prevention regulations (UVV) "Elektrische Anlagen und Betriebsmittel" [Electrical installations and equipment] stipulated by the German Employer's Liability Association for the energy, textile, electrical and media product sectors (BGETEM).